So many different types of doors are available today that if you have a unique architectural idea it just may be available! 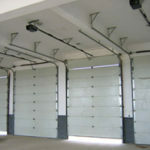 Low headroom, standard, high-lift and full vertical lift doors all custom built to your specifications. We offer insulated, non-insulated, full-glass view, wood, composite, and many other door styles. With so many different environments in today’s market place and industrial manufacturing or architectural needs, there is a door suited for your needs. With energy costs soaring it is more important than ever to insure the building is adequately sealed against the elements. It is proven that properly maintaining mechanical equipment allows it to last longer, work better or retain more long-term value when properly maintained. Typically the largest moving objects in a business, it is crucial your doors operate safely and properly to insure long term safe and proper operation. Let Quantum Door Services custom tailor a maintenance plan to save your business money and have your doors operate safe and proper.